Straight teeth provide better chewing efficiency and reduce the risk of jaw joint issues such as TMJD (temporomandibular joint disorder). They are easier to clean, lowering the risk of tooth decay and gum disease, and they can dramatically improve your self-confidence. For more than a century, metal braces were the best way to straighten your teeth. Today, though, there is an even better solution. Billed as “the clear alternative to braces,” Invisalign offers a number of advantages over traditional braces. Here are just 4 of the top benefits of Invisalign. Metal braces are tough on teeth. It is hard to clean around them, and they can cause demineralization. Invisalign uses a series of removable plastic aligners, allowing you to brush and floss as usual. Since the aligners have no hard metal brackets or wires, there is nothing to damage your teeth. Before your treatment begins, we will create a digital 3-D model of your teeth. We will then morph this to show you what to expect at every stage, including the final results. Braces require you to guess what your smile will look like. Invisalign lets you know for sure. Invisalign can allow the patient to visualize how your teeth will move throughout treatment as well as their end result. Metal braces are bonded to teeth and remain throughout the entire treatment, and you must make frequent orthodontist visits for adjustments. If you pop a wire or have another issue arise, an emergency appointment is required. Invisalign puts you in control of the treatment process. You simply wear each aligner for 20 to 22 hours per day. 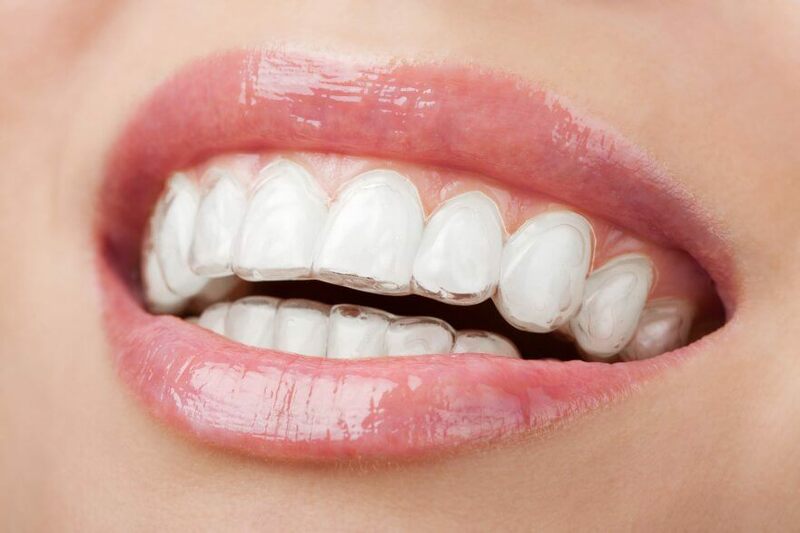 Aligners are changed every week and patients are seen on average every 8-12 weeks. You will only need to see the orthodontist once every four to six weeks. In addition, the total treatment time is often less for Invisalign than for braces. Wearing traditional braces means making sacrifices. You will receive a list of off-limits foods. The metal may cut or scrape your tongue and cheeks. You cannot hide the fact that your mouth is full of metal, even on special occasions. Invisalign’s smooth, clear, plastic aligners have no sharp edges to cut or scratch. They are nearly invisible, so no one but you needs to know you are undergoing treatment. And the aligners are removable, so you can simply pop them out to eat. At one time, Invisalign was more expensive than braces, but this is starting to change. Cosmetic upgrades to braces, such as ceramic tooth colored braces, can boost their price. Invisalign uses an all-inclusive fee structure. Many dental insurers are starting to recognize the value of Invisalign and have begun to cover it. Like any other treatment, Invisalign is not right for everyone. For many people, though, Invisalign is the best choice for their busy, active lives. We will perform a thorough assessment and let you know if Invisalign is a good choice for you.